The story of American golf is the story of John Reid and his efforts to organize the Saint Andrew golf Club at Yonkers, New York. Four moves later in 1897, it arrived at nearby Hastings on the Hudson where it remains to this day. John Reid was born in Dunfermline in 1840. He came to the United States as a young man and settled in Yonkers. Among his friends was another Dunfermline native named Robert Lockhart. Another was Andrew Carnegie who was also a good friend of Reid. It was Lockhart who triggered the idea in Reid's mind to start a golf club. When Lockhart returned from a trip home, he brought back a few golf clubs and golf balls. Reid borrowed them, practiced a bit and decided to get some of his friends involved in the game. On February 22, 1888, George Washington's birthday, Reid invited friends and neighbors to come to the cow pasture across from his home for a demonstration of the ancient and honorable game. Reid had laid out three holes, and the game proceeded with John Reid playing with John Upham. They had only the Lockhart clubs which they passed back and forth as they played. Later that spring, the three hole course was crowded and the course had to be moved and enlarged. In 1892, they moved once again to the Grey Oaks farm which was purchased from a nearby farmer. The club now had 120 acres and laid out nine holes. Golf was a sport whose time had come. It had snob appeal. Football and baseball were in their infancy and had mass appeal. The formal organization of the games was at a dinner party in the Reid home on November 14, 1888. He told his golfing partners that the dinner would have "particular significance". Reid had already begun the Scottish custom of the "19th" hole. His friends came to his home after the game for "a wee drap". After dinner the formal organization of the club with dues and a constitution and bylaws was completed and Reid was elected their first president and the name ‘Saint Andrew's Golf Club of Yonkers' was approved. Mrs. Reid was also interested in the game and the records show that she and a Miss Carrie Law were the first women to play golf in the U.S. Mrs. Reid and Miss Law played the first mixed foursome with John Reid and John Upham. 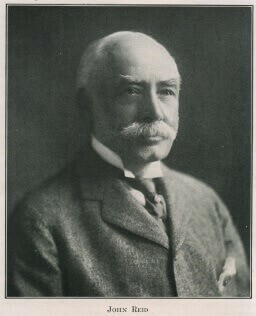 John Reid's two sons continued the family interest in golf. John Jr. won the club title 3 times. The other son, Archie, won it 11 times! When John Reid died in 1916 in Yonkers, he was memorialized in many ways. He was eulogized thus: "This was the man who fathered the growth of golf and left to us the heritage of Saint Andrew's." Postscript: Mr. James. C. Thomson's article initially appeared in the Jan/Feb 1982 issue of the Highlander magazine.